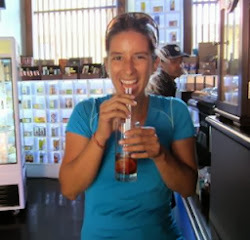 Drea's Food Adventures: Kathmandu: Week 1! 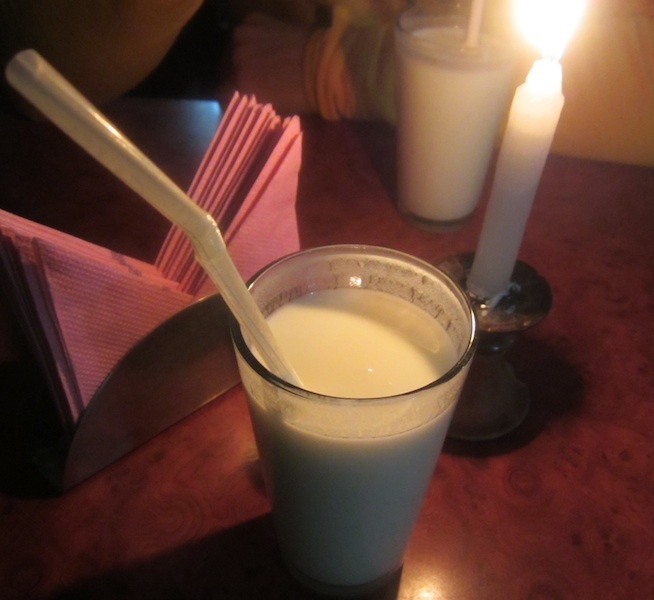 Lassi and momo galore in Kathmandu! Food in Kathmandu, Nepal has been really good so far. We arrived in the late afternoon and the first thing we had was a mango lassi from Pilgrims Feed N Read Restaurant in Thamel which tasted like heaven. 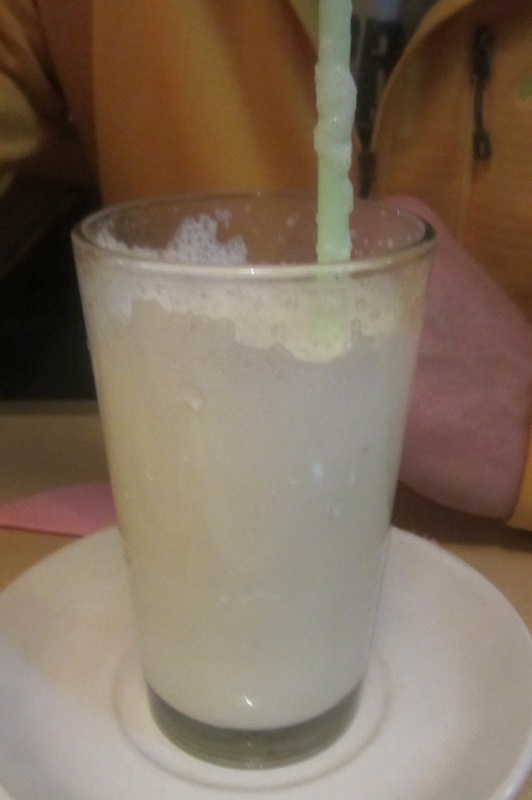 Lassi is similar to kumis, which is a yogurt drink and you can get it with banana, papaya, apple and other fruit, or just drink it plain/tart. I wanted to help my stomach get used to the new diet and yogurt, with all its probiotic goodness, seemed like a great first thing to have. We also enjoyed some yak cheese and vegetable steamed momos (stuffed dumplings) along with a potato dosa, which is an Indian dish, very similar to a thin, crispy crepe. The yak is like a Himalayan buffalo and is a very useful animal, not only for food, but also for carrying goods up and down the mountains where there are no roads. Banana lassis with dinner. Candlelight is often used since there are long power outages in the city. We couldn't stay up past 8 pm the first night as Jet Lag hit us hard so we went to bed very early. The breakfast at our guesthouse is included and is very basic: two eggs and toast with "dud chiya', the delicious spiced milk tea. The eggs here are very tasty and I have had my share of orange yolk eggs, a good indication that the hens we get these eggs from have a good life and diet! We went to a small Nepali restaurant for lunch on our second day, Thakali Bhanchha off of Z street and we weren't too hungry yet so we ordered one dish and got lemon sodas. Lemon soda is just lemon juice with plain soda added to it. It's really refreshing and it guarantees that your drink is safe: tap water here is not at all potable and it's best not to risk it. The mutton curry we ordered came on a metal plate with a large serving of rice in the middle, a bowl of yellow lentil curry, pickled radish, two spicy sauces, spinach, cauliflower and potato and a side of yogurt. We got free refills once we were done and we felt really bad because we shared only that one plate. The tip we gave at the end was rather large. For dinner, we went to Yak restaurant, which is a Tibetan establishment, and ordered pork and vegetable momos and also got a buffalo soup with clear noodles. We heard about the hot Tunga beer they eat there but we have not really felt like drinking alcohol so we missed out on it. Again, we passed out early as we succumbed to the intense jet lag (it took 36 hours or so just to get here!). We started our morning at Pilgrims and had some lassi and we had a potato paratha (Indian dish) for a late morning snack. All the food at Pilgrims is vegetarian and this one was really tasty as it was made to order and took about one hour to come out! We changed it up a bit and met up with our friend Carole and went to an Israeli restaurant, OR2K and ordered some more vegetarian food. There was a special dish served only on Friday and Saturday so we ordered it. Jochnne, I believe it was called, is a pastry that is cooked over night and is served with a green chutney and a really good tomato garlic sauce with a boiled egg on the side. 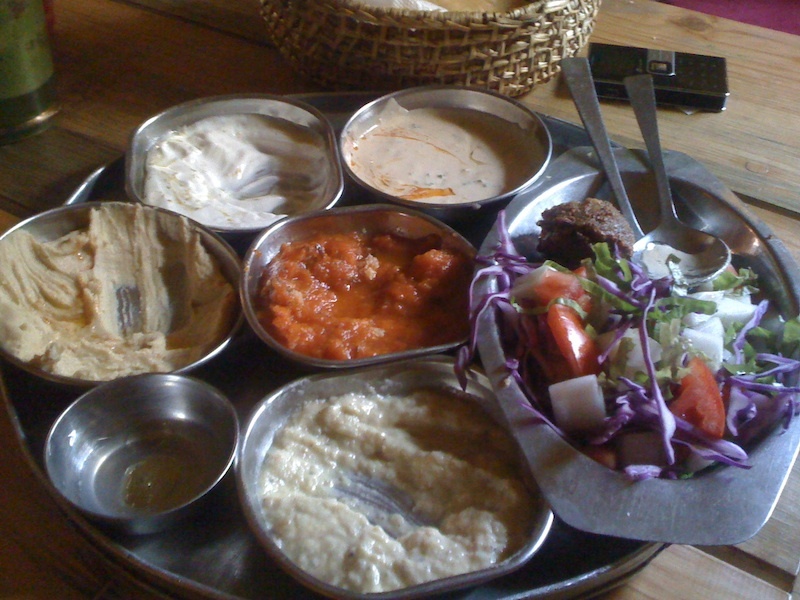 We also shared a large platter of hummus, labneh, falafel, babaganoush, tahini and a tomato eggplant dip. We also ordered mint lemonades to wash down our food and we couldn't really finish it all - the portions were very generous. Believe it or not we had dinner that night at Nepalese Kitchen, a Nepali/Newari restaurant very close to our guest house. 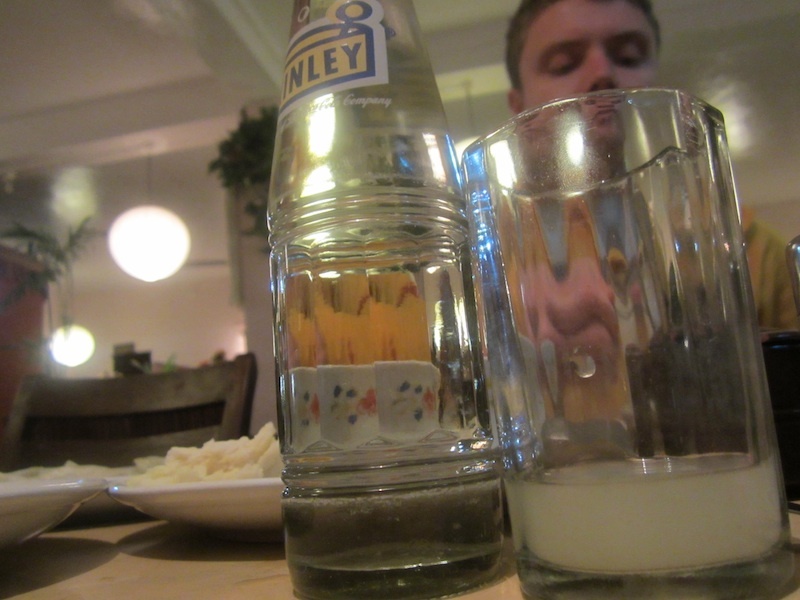 For habit sake, we started our meal with a banana lassi, no sugar. We had a candle-lit dinner and tried Bari, which are meatballs with a sweet marinade, vegetable pakoras and a grilled chicken with pulao rice. The pakoras are basically shredded vegetables such as cabbage, carrots, cauliflower that are spiced and dipped in an egg batter and then fried. They are really good and we ate a whole plate of them. The pulao rice with our chicken was also very good, it had peas and some nuts as well as fruit. We were a little skeptical about ordering the chicken since most of the chicken shops we have seen around here have no refrigeration and chickens just sit out there at room temperature for hours... we bit the bullet though and I'm happy to say the chicken did not betray us! We were ambitious and had ordered two desserts but we had to cancel the order, we were too full and tired. Suddenly, the weekend had arrived and it felt like we had already been in Nepal for ages! We had a great foodventure experience during the weekend, I'll detail them all in my next post about our first weekend in Nepal.